“The music is avant-garde, improvisational as well as compositional….One might call it ‘classical,’ another ‘jazz.’ It could be either or both, but I think it defies classification….” – Kay Gardner, Composer, in Paid My Dues. “…ethereal, sensuous, and teasing, the songs are romantic, whimsical, yearning, and fun.” – Merry Gangemi, Producer, Host, Woman-Stirred Radio, Radio Goddard, GDR. – Padma Hejmadi, author of novels, short stories and non-fiction. Two Gems in a Jewel Case: Lyric poems by Sappho set to original music by Jeri Hilderley for guitars, marimba and voice, presented in a CD jewel case with a full color, 32 page collectors’ book, which includes lyrics, artwork, reproductions of original Greek papyri of Sappho's lyric poetry, and more. Translations are by Pulitzer Prize nominee Konstantinos Lardas. Produced in collaboration with WordSpace Publications. "IT SEEMS everyone’s boarding the Sappho boat these days, eager to travel with the ancient poet and tell the world who she was. 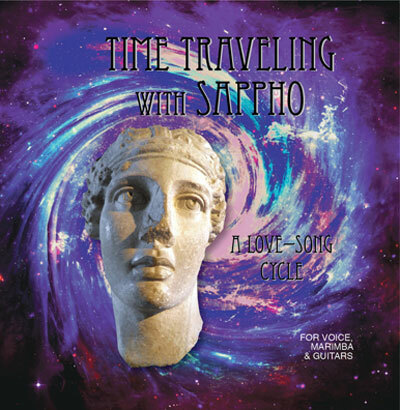 One person well qualified to be Sappho’s herald and interpreter is singer, songwriter, and musician Jeri Hilderley, who pays homage to the poet with a stirring new CD, Time Traveling with Sappho. Hilderley co-produced the album with bassist Janet Mayes, who is also her life partner, and with the help of sound engineer Bruce MacPherson." "The CD is thus an amalgamation of two recordings by the same artist separated by some 35 years, and the effect is mesmerizing." The SeaWaves present “Protest for Love,” eight music videos on YouTube. Here is Number 6: Stay tuned for more!